Add style and convenience to your kitchen with the TopZero Ankara Sink. This farmhouse sink is perfect for stone countertops, including granite. Made with 304 Grade stainless steel, this kitchen sink will last for years to come. Since this is a Top Zero sink, it’s designed to reduce the buildup of grime and scum. Say goodbye to grime, scum and germs that can build up on the rims of your kitchen sink. This Top Zero farmhouse sink is made for rimless, seamless integration with your stone countertops, and it’s the newest and most innovative alternative to traditional undermount kitchen sinks on the market. 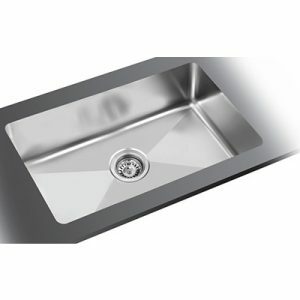 This 304 Grade stainless steel sink also comes equipped with premium, aluminum-coated sound absorbing pads. Order yours with Fiberpol today!